With just one round of the 2017 FIM SuperEnduro World Championship remaining Rockstar Energy Husqvarna Factory Racing’s Colton Haaker sits at the top of the series standings following a third-place overall result at the penultimate round of the championship in Spain. Dominating round two of the series in Germany, Haaker secured 3/2/3 results in Bilbao and now carries an 11-point advantage into the deciding final round in France. Enduring a tough night Haaker’s team-mate Pascal Rauchenecker placed seventh overall. Despite his third place overall result the third round of the SuperEnduro World Championship didn't go quite as Colton Haaker hoped it would. Comfortable on the series’ most technical track to date, the FE 350 mounted rider posted the third fastest time in the Superpole qualifying session before going on to finish in the same position in the night’s opening final. Securing his best result of the event in the reversed start order second final, Haaker finished less than five seconds behind race winner Alfredo Gomez. Bringing his night to a positive close with a third-place result in the third and last final, Colton earned himself a place on the podium alongside Alfredo Gomez and Jonny Walker. 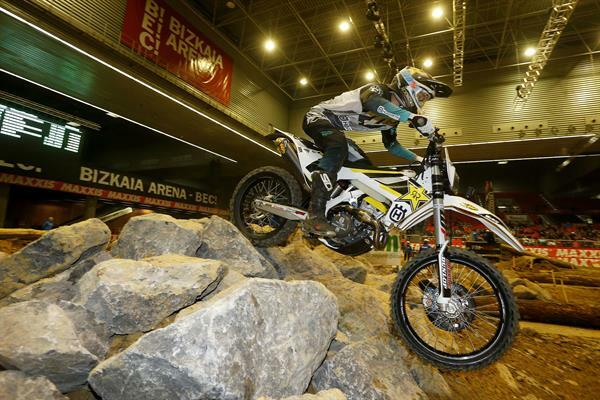 Superenduro rookie Pascal Rauchenecker endured a tough night in Bilbao. Competing in only his third Superenduro event the motocross turned enduro racer struggled with the highly technical track. Giving his all throughout each of the three finals, Pascal placed seventh overall having placed in the same position in each of the three finals. Rockstar Energy Husqvarna factory racing riders Colton Haaker and Pascal Rauchenecker will be back in action at the final round of the 2017 FIM SuperEnduro World Championship in Albi, France on March 18.